The Echoes of Kindness hostess set is another of my favourites from the new catalogue, and in a completely different style to Trendy Trees (see last post). This one is gorgeous for watercolouring, which I have done in various ways. 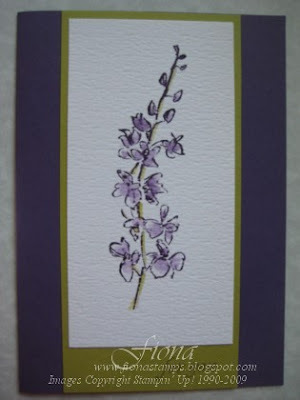 For this card I stamped Elegant Eggplant onto watercolour paper, then painted loosely within the lines using the Aquapainter and the Watercolor Wonder crayons. I ran an Old Olive marker along the stem. A quick elegant card which became a Mothers Day card for my mother-in-law.